Hey fellas should have told you guys this earlier... Harry Mann is back. He's brought a few more with a few more Filipinos with him... Someone run a count for us... 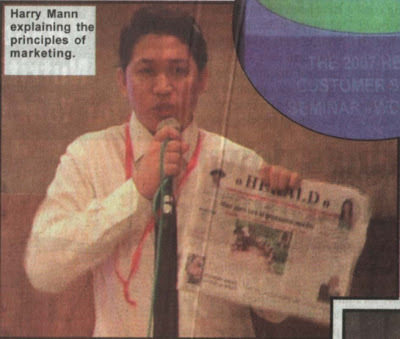 The ratio of Filipino's vis a vis locals in the newspaper's administrative/marketing set up. Would be a nice figure to have..
Herald needs Harry Mann badly. They have had to hike everyones salary (people that count that is! Not you...) and they need their cash flow to improve. So get ready for an avalanche of advertorials! Digu are you listening? Anon 1: Can Herald not find talent here itself? Hikes are good but there is plenty of inflation. So the hike is no great deal! Has Mann turned over a new leaf? Has he got rid of his alleged corrupt ways? Hope he has man! Ha ha ha Harry for pro-employee? Will he really help capture the market? With cash for editorials? What are you, Raul's a...licker? Anon 3: You have a supporter in me (read with anon 2). I disliked the TOI(Mumbai ed.) for it's excessive ads. For real news, I prefer GT any day. (Though I was rather annoyed by Derek's rather premature editorial in the Scarlett case) It gives me bang for the buck. Even if TOI(Goa ed.) resorts to predatory pricing, I ain't going to be a sucker this time around. At the end of the day, I'm not content with reading just 1 paper. "He's brought a few more with a few more Filipinos with him..."
Well, looks like you are no better! last anon: their pronounciation is atrocious!!! And HCN's duo of Suzanne Telles & Gwen Gomes are trying to immitate their accent. Listen to the news (whenever it is on air that is) and you will know what I mean. oh...i tried eating dog an it is so delicious.you mix it with masala...or with curry..
A MOLE IN THE MEDIA -- WHO'S THIS EDITOR?